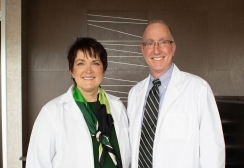 We are Dr. ML Shayne and Dr. Howard Shayne (known around the office as Dr. ML and Dr. H). 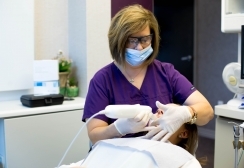 We opened Fox Grape Family Dentistry more than 25 years ago with the goal of creating a practice that catered to whole families — from children to grandparents — in a friendly and inviting atmosphere. We think one of the greatest joys of being a dentist is turning a fearful dental patient into a confident one that actively seeks out dental care. We find happiness in watching young patients grow before our eyes, and building relationships with all patients has been an important part of our practice. After graduating from Baylor College of Dentistry, we taught together at a dental school while working at separate private practices. Originally, we wanted to stay in education, but during a vacation to Springfield to visit a cousin, we fell in love with the area and soon found a great location to open a practice of our own. Because of our love for learning, we always take it upon ourselves to go above and beyond professional requirements when furthering our education in the dental field. We are constantly looking to gain new knowledge in dentistry and use new technologies to make dental services easier for our patients. We are still so excited to be a part of the Springfield community after all these years, and we look forward to meeting you and exceeding your expectations. ©2016 Fox Grape Family Dentistry. All Rights Reserved.